You can configure several parameters, to adapt the scheduling and calculation process of Portfolio for JIRA, according to how your needs. This setting is only relevant if at least one team works in Scrum mode. If turned on, there will be warnings in the backlog if certain stories are too large to fit into a single sprint. These items are scheduled anyways, potentially across multiple sprints. Turn this warning on, if you do care about having stories that are fine-grained enough to fit into single sprints. If this is not relevant for you doing rough planning and scoping, turn it off. Planning unit Changes the estimation unit across the whole plan (hours, days and story points). If changed to hours, all estimates will be interpreted as hours, totals and planned/available capacities will be displayed and reported in hours. The default sprint length for all teams in this plan. Default Estimate Sets the default for stories and epics that are used when estimating unestimated stories or epics in the backlog. 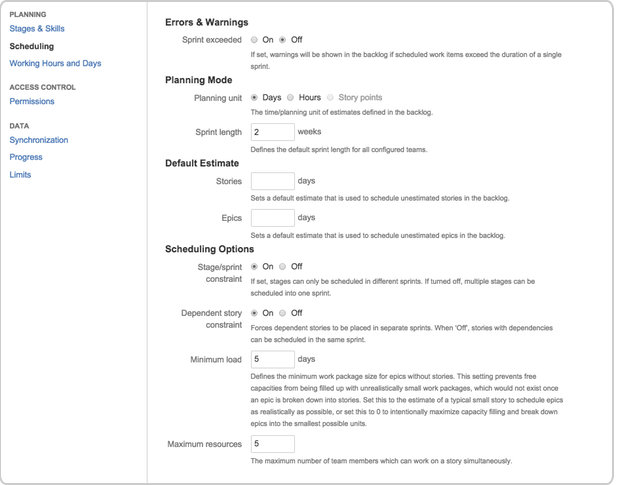 This setting controls whether the different stages of work will be scheduled in sequential sprints, or can be scheduled for the same sprint as well. Please refer to Classic plans iteration-based scheduling (Scrum) for details and examples on how stories are scheduled with or without this constraint. This setting controls whether a dependant story can be scheduled within the same sprint. By default, the setting is "Off" so that dependant stories will be placed in subsequent sprints. When 'On', stories with dependencies can be scheduled within the same sprint if there is available capacity. Minimum load Defines the minimum work package size for epics without stories. This setting prevents free capacities from being filled up with unrealistically small work packages, which would not exist once an epic is broken down into stories. Set this to the estimate of a typical small story to schedule epics as realistically as possible, or set this to 0 to intentionally maximize capacity filling and break down epics into the smallest possible units. The maximum number of people that can work on a story simultaneously. More precisely, this setting applies per stage of work. If stage/sprint constraints are on, this actually means that at maximum the configured number of people work in parallel. If the constraint is turned off, then stages of work can be scheduled in parallel, and it could mean that even more members work in parallel. In practice, however, this will anyways be constrained by the number of teams and members, their availability and how many people have the right skills to work on a story.